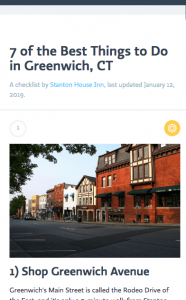 If you are planning a visit to historic Greenwich, Connecticut, in the near future, then stop researching and free checklist for planning a Greenwich, Connecticut visit! Greenwich Connecticut has truly become a vacation destination for visitors from as close as New York City and from around the globe. Wondering where to go in Connecticut? The next time you tour Connecticut, be sure to plan a stop in Greenwich, Connecticut! Greenwich is one of the easiest Connecticut weekend getaways to plan, and is close to many of the most beautiful places to see in Connecticut. Before you plan your trip, be sure to download our ultimate vacation guide to Greenwich, CT to ensure you get the most out of your visit to one of the top Connecticut vacation destinations.